advertisers, politicians, economists, and others are using the latest findings on the human brain to reshape our lives, from the bedroom to the boardroom. Despite the potential benefits, there’s obvious peril in the promise. Richard Restak explores the troubling moral and legal dilemmas that arise from corporate and political applications of this new brain research. Someday we may live in a world where our choices, our professional and personal prospects, even our morals and ethics will be controlled by those armed with an elite understanding of the principles of neuroscience. Eye-opening and provocative,The Naked Brainis a startling look at the impact such unprecedented access to our most secret thoughts and tendencies will have on all of us. InThe Naked Brain, bestselling author Richard Restak explores how the latest technology and research have exposed the brain and how we think, feel, remember, and socialize in unprecedented and often surprising ways. Now that knowledge is being used by doctors, advertisers, politicians, and others to influence and revolutionize nearly every aspect of our daily lives. Restak is our guide to this neurosociety, a brave new world in which brain science influences our present and will even more tangibly shape our future. 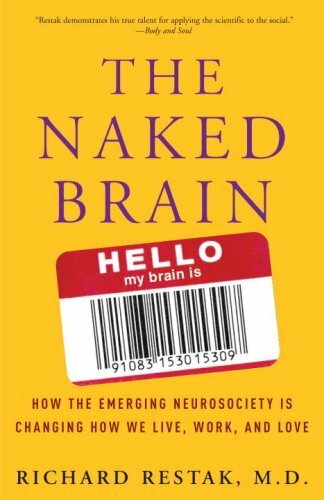 Citing social trends, shifts in popular culture, the rise and fall of products in the public favor, even changes in the American vernacular,The Naked Brainis an illuminating and often troubling investigation of the impending opportunities and dangers being created by the neuroscience revolution, and a revelation for anyone who ever wondered why they prefer Coke over Pepsi or Kerry over Bush. From the Hardcover edition. He is a neuropsychiatrist and clinical professor of neurology at George Washington University Medical Center. Author of the bestselling The Brain, a companion to the PBS series of the same name, as well as The Mind and The Brain Has a Mind of Its Own, he lives in Washington, D.C.